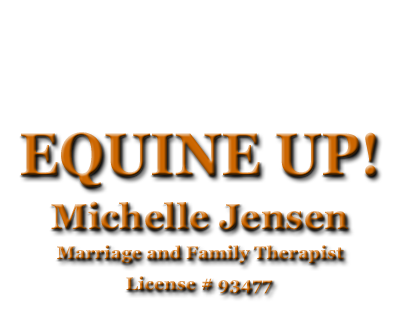 Equine Assisted Psychotherapy and Equine Assisted Horsemanship & Learning? Equine Assisted Psychotherapy, and Equine Assisted Horsemanship and Learning are two modalities that incorporate activities with a horse or horses to encourage and motivate individuals to learn about themselves and others. 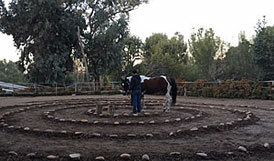 The behavior of a sensitive horse provides information about the clients that helps the therapist guide them to realizations about themselves and to over come stuck areas in their lives. Horses by their large presence naturally draw people into the here and now. They naturally put people in touch with their own authenticity. Some of the benefits of developing a relationship with a horse include: building respect, developing leadership skills, developing better social skills, increasing self-esteem, companionship, affection, touching, feeling for another, well-being and increased quality of life..
Equine Assisted Psychotherapy sessions engage individuals in activities in which the horse acts as a mirror reflecting feelings and emotions that might be hidden by the client. The horse brings the client into the present moment and strengthens their awareness by focusing on what's at hand. The act of just being in their presence and carrying out activities with a horse is a strong platform to explore a clients issues and emotions. Any activity can be taylored to target a clints problems. All experiences can represent therapy moments. Sessions focus on specific issues, and are designed to give an experience that opens up feelings that can be talked about and processed. 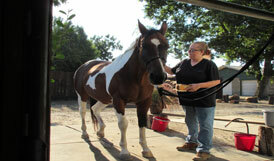 Equine Assisted Learning sessions teach individuals basic horsemanship skills, which in turn teaches about oneselve. Learning horsemanship helps strengthens relationships skills, improves self care and care of others, develops awareness of boundaries, respect and trust. Both modalities can be practiced alone or combined in any client session. Horsemanship encompasses everything that has to do with learning and mastering the skills that are needed to connect and hold an intimate relationship with a horse. Developing horsemanship with a animal so large and magical is a strong self-esteem boosting experience. It builds confidence and helps a person to overcome fears. What one learns through horsemanship carries over into their own life. It offers people the opportunity to grow emotionally and physically. To connect to an animal in such a way, not only develops our emotional intelligence but strengthens our physical body as well.